I have been so bad about blogging! I've been pretty active posting photos and such on Facebook but I have neglected the blog. Somehow it's easier and faster to do the Facebook route, but when I do that the readers of the blog that are not on Facebook miss out on a lot. We now have HD TV. The third try was the charm to finally get a person out to exchange our old Direct TV dish for the new HD one. That happened about three weeks ago and I'm so happy to have a DVR again where we can record our shows, pause shows and all that other good stuff. Our new TV is wonderful and best of all hardly takes any electricity to run at all which is very important in a battery-powered house. We now have phone service inside the cabin! woohoo! We finally broke down and bought a signal booster and we now have four bars inside and our phone now rings! Amazing! I know this doesn't sound very exciting to most of you, but to us it's a big deal. The barn delivery. Sigh. Today was the second scheduled day for the delivery of our barn and they cancelled because they were afraid of the rain that was predicted for us. It was put off from its original delivery date of June 17th because they could not get the barn down our driveway without a certain piece of equipment that they had on order. We had to wait for the "mule" to arrive at their facility and then wait for them to mount the "mule" on a flatbed trailer, or whatever. Maybe the third time will finally be the charm for the barn. We are now scheduled for a Wednesday July 6th delivery. Let's hope the roads in aren't muddy and there is not a big rain event happening. We really need that barn to arrive! 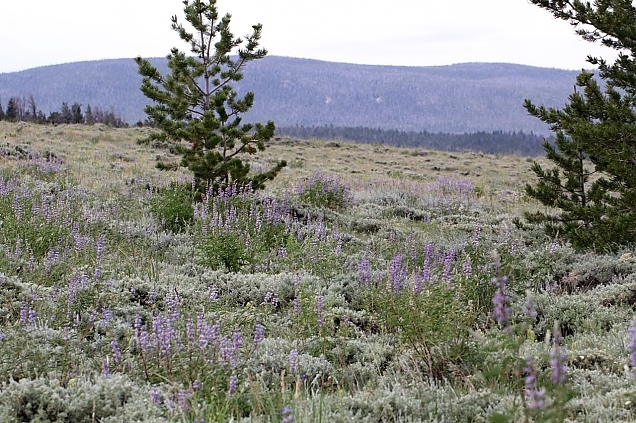 The lupine is rampant in the meadows and along the roadsides right now. All you can see is a purple haze, it's just gorgeous. Now joining the lupine in bloom are the yellow Alpine Paintbrush and the magenta Loco. I need to get out there and take a photo of our "flower garden." 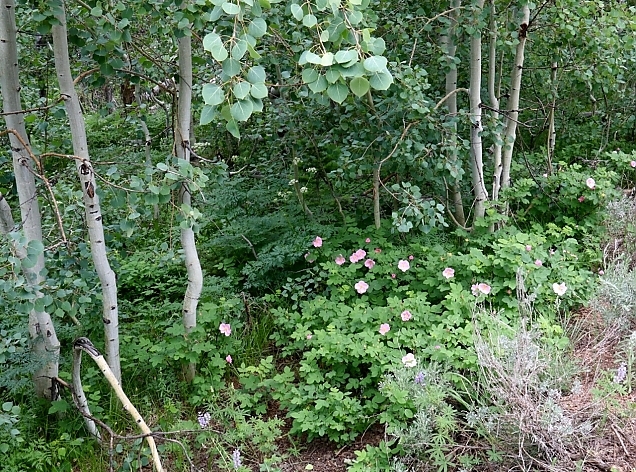 The rose bushes are going crazy as well as the columbines. 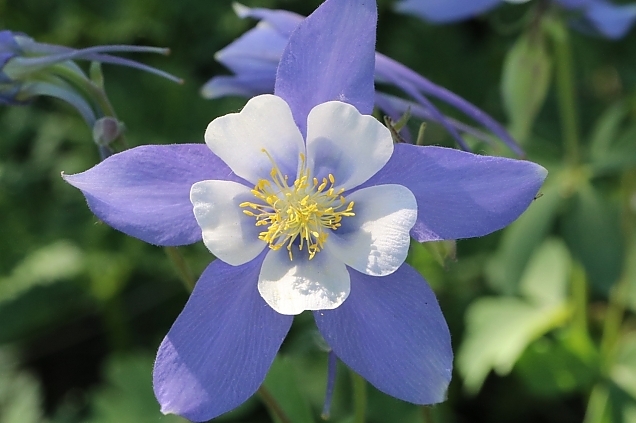 I have never seen so many columbines here before. They are spreading across our newly opened meadow. 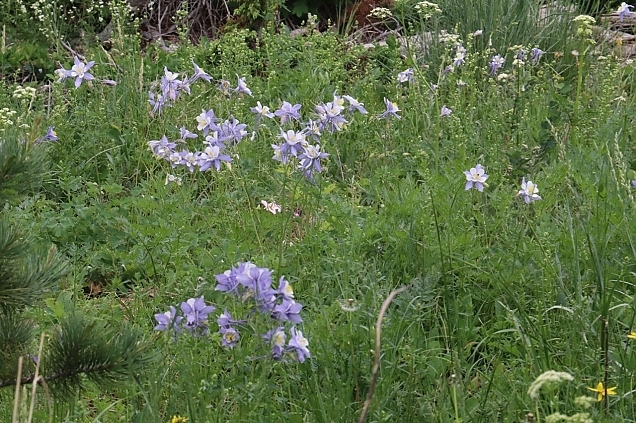 And folks, none of these were planted, all the flowers are wild. Now for the birdhouse updates. You'll remember I said we had a resident house wren. Well, that turned out to be a false alarm. He built the nest, sang his heart out for days and when he couldn't attract anyone to come and live with him, he abandoned the twiggy nest. The minute we put another bird house at the top of the driveway, yet another wren made a twiggy nest and then we saw nothing. We peeked in last week to see an egg but no bird around to hatch it. Next time we looked there were a few pieces of shell in the nest and nothing else, so we dumped the contents. Now there is yet another twiggy wren nest being built. 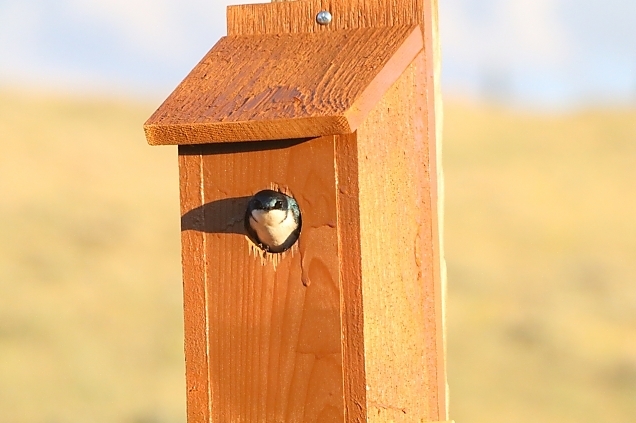 Success with one bird house, a pair of tree swallows are at home and hopefully raising a family. 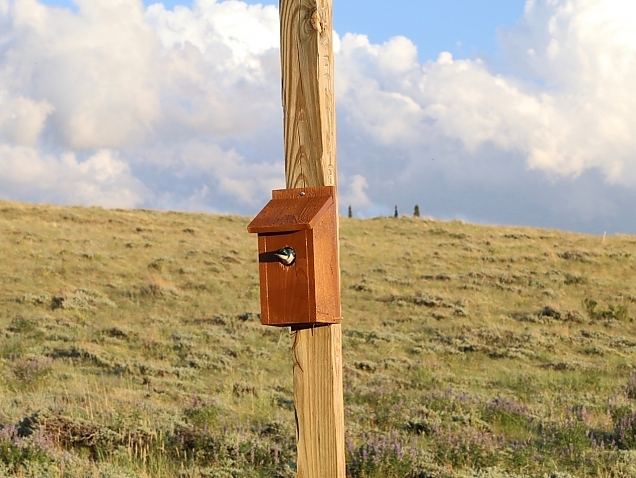 It's supposed to be a bluebird house, but so far no blue bird takers. At least we have a renter, even if it's not blue. We often see them poking their heads out when we go by. On the moose front, we have seen so many different moose now. 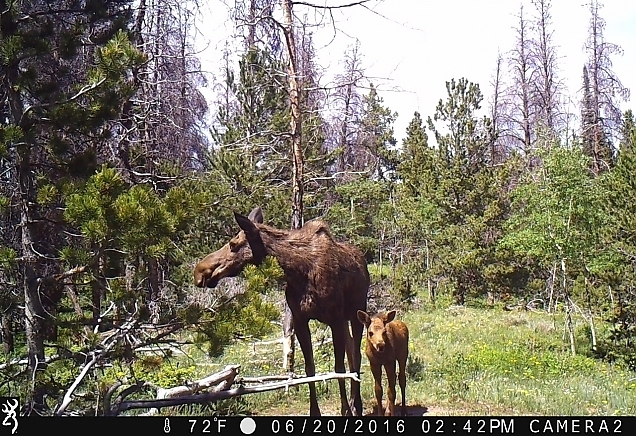 Sometimes we only catch them on the game camera, but we've been lucky enough to see a few in real time, like this cow moose and her young calf at our salt lick. The baby was very curious about our fire pit and we watched it as it sniffed our Adirondack chairs. 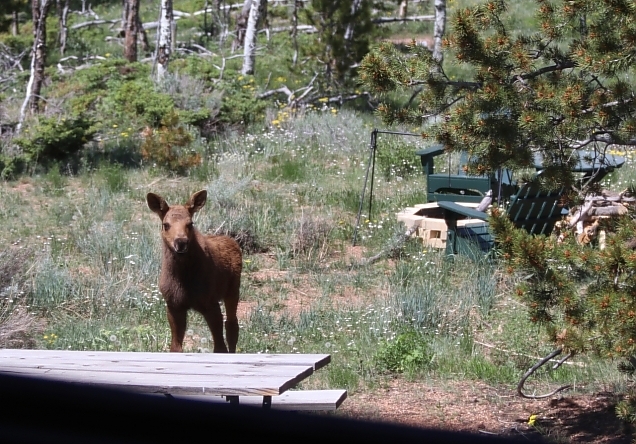 He/she was so close to the cabin that I shot these two pics from the front porch through the screen. The photo of the two of them was taken from the game camera because I could not get a good shot of them. We've caught them on the game camera one other time -- and at the very same time of the day! 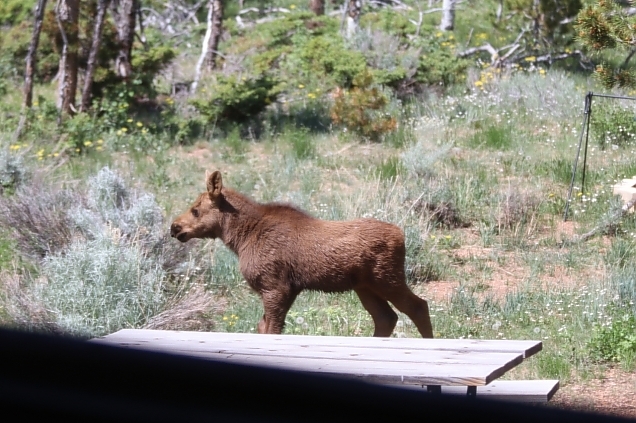 I vow to look out now every day at approximately 2:30 p.m.
We also had this big bull moose visit us. In fact, on the morning I saw him I had looked out the windows first thing in the morning to be sure no animals were around in the meadow, opened the door to let Destin out and he just stood there looking at something and not getting off the step. When I looked up I saw this huge moose right there in our driveway! Yikes, he was big! 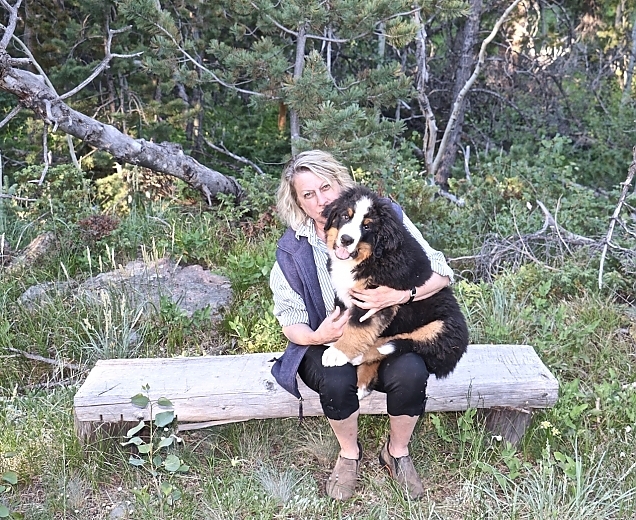 I scooped Destin right up and came inside while the moose trotted off up our driveway. The game camera caught him visiting and he was here most of the night before. Here is a capture from the game camera and also a short video clip of him which you can see at the end of the post. 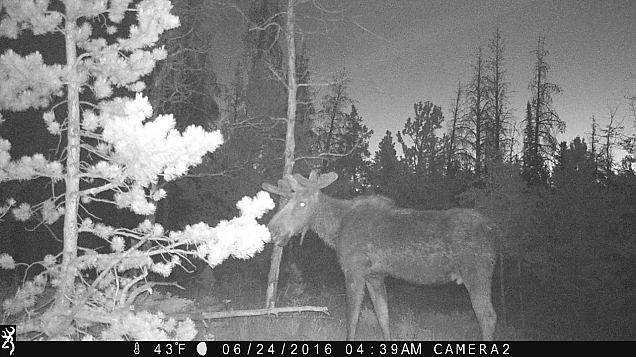 You can see the time stamp on the photos is 4:39 a.m. and I saw him not long after this at around 5:00 a.m. We've seen at least 8 different moose so far and I had started out naming them like I used to name the bears in our yard back in New Jersey. Now I decided that was not going to work -- too many! Love seeing them. To finish up, we had our very first Rufous Hummingbird of the season this morning. Bossy pants that he is, he's gorgeous! I need to get a photo of him soon. Well, I hope you've stuck with me through all this rambling on and tons of photos. If you have, bless your heart. I think that about catches you up for now. I'll try and do a better job of blogging so the posts don't get this long! He's had a growth spurt over the past few days and can't lay under the bed anymore. He has outgrown all his favorite spots to sleep and gets very cranky. He continues to be a joy. His adult coat is starting to come in a bit and he has what looks like a receding hairline on his forehead. Pretty soon he'll have a puppy "fro" going on which is always a funny stage of growth. He's growing up fast.